I received a complimentary copy of the book from the Netgalley, publisher in exchange for an honest review. This does not affect my opinion of the book or the content of my review. 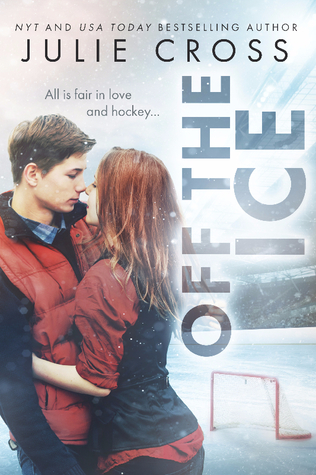 Usually, I have to be in the mood to read a Young Adult Contemporary story, but Julie Cross’s Off the Ice was something that caught my attention, when I was reading the synopsis. The cover also caught my eye as well. It didn’t take me long to read Off the Ice, especially due to the storyline that Julie wrote for the characters. One thing I really enjoyed about Off the Ice was actually the beginning of the story, when the characters are first introduced. Claire O’Connor ends up in a situation, where she handles it pretty well with a guy that she thought would be totally different. She also helps out the other main character Tate Tanley, when he gets in a sticky situation as well. Both of these characters are battling separate issues in the story and both issues touched my heart and made me feel for both of them. Tate with his infatuation with Claire in the story, especially when she comes back from college temporarily. He wants to win her over and help her out with what she’s going through. Claire did help Tate over a year ago with his situation with his father. Claire is going through so much in the story that I definitely wish I could’ve given her a hug. She’s back in town due to taking care of her father and the family business. Her focus is with her family and she put everything else in hold because her family needs her. Tate + Claire = adorable together. These two went through so much in the story, and when they finally gave in to their feelings I was beyond happy for them both. There is family drama in the story, especially with Tate and his dad (I didn’t like Tate’s dad at all). I did like Tate’s stepfather who was there for Tate. I really liked being Juniper Falls and also reading a story that involved the sport hockey and also a couple of characters that needed each other a lot. Julie Cross is a New-to-Me Author and I look forward to checking out the other books she has written and also checking out the next book in the Juniper Falls series. I give this book 4 stars and highly recommend it to YA contemporary readers out there. If you are looking for a YA contemporary that has an adorable hockey player and a girl who loves her family then you’ll enjoy this story.